Following her guide to the first twelve chapters of "Acts", Christine Platt tackles the remainder of the exciting story of the Early Church. After the tumultuous events at Pentecost, the gospel has now spread throughout Jerusalem, Judea, Samaria and parts of Asia, in keeping with Jesus' prophecy ("Acts" 1:8). Luke, the writer of "Acts", now turns his attention to the regions beyond - 'the ends of the earth'. In this Bible study guide, we follow the endeavours of the apostle Paul and his co-workers as they reach out to Gentiles as well as Jews. We are reminded that we are called to witness to the ends of the earth also, whether that be a far off land or the unreached community across the street. And if we feel inadequate for the task, we are reminded that the same Holy Spirit which empowered the first Christians is in us and with us too. 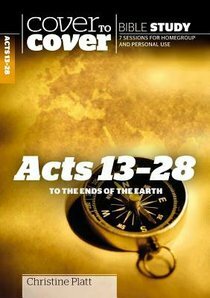 About "Acts 13-28 - to the Ends of the Earth (Cover To Cover Bible Study Guide Series)"
Christine Platt lives in New Zealand and her Mission involvement means she regularly travels to East Timor, taking teams to support the indigenous church in its courageous witness to war-ravaged people with Bible teaching and practical projects. Her life goal is to make the Bible accessible by both writing and speaking, so that people may understand more of God's outrageous grace. Cover To Cover provides a unique resource for group and individual study. Each book consists of seven stimulating sessions and includes opening ice-breakers, Bible references, discussion starters and suggestions for personal application. There is an introduction that sets the topic in context as well as helpful notes for group leaders. Order now to secure your copy when our stock arrives. 0 Available. Expected to ship August 2019.